Guru Gobind Singh became tenth guru at a young age after his father's martyrdom. The Guru engaged in warfare fighting the tyranny and oppression of Islamic Mughal rulers who sought to suppress all other faiths and obliterate the Sikhs. He married, raised a family, and also founded a spiritual nation of saint soldiers. Though the tenth guru's lost his sons and mother, and countless Sikhs to martyrdom, he established a method of baptism, a code of conduct, and a sovereignty which survives until today. Born at Patna in 1666, Guru Gobind Rai became tenth guru at age 9 following the martyrdom of his father, Ninth Guru Teg Bahadar. At age 11 he married and eventually became the father of four sons. The guru, a prolific writer, compiled his compositions into a volume known as Dasam Granth. At age 30, the tenth guru introduced the Amrit ceremony of initiation, created the Panj Pyare, the five administers of initiation rites, established the Khalsa, and took the name Singh. Guru Gobind Singh fought important historic battles which robbed him of his sons and mother and eventually his own life at age 42, but his legacy lives on in his creation, the Khalsa. Before his death, he compiled the entire text of Adi Granth Sahib from memory. He infused the scripture with his light passed to him from First Guru Nanak through the succession of subsequent gurus, and ordained the scripture his everlasting successor Guru Granth Sahib. The birth of Gobind Rai destined to become tenth Guru Gobind Singh, took place during the light phase of the moon in the town of Patna located on the River Ganga (Ganges). Ninth Guru Teg Bahadur left his mother Nankee and his pregnant wife Gujri in the care of her Brother Kirpal under the protection of the local Raja, while he went on tour. The event of the tenth Gurus birth sparked the interest of a mystic, and brought his father home. When living in Patna as a toddler, Gobind Rai had a favorite food prepared for him daily by a childless queen who fed him while holding him on her own lap. Gurdwara Bal Lila of Patna, built as a tribute to the queen's kindness, is a living langar legacy and serves the tenth guru's favored langar of Chole and Poori to visiting devotees every day. A very old poor woman shared all she had saved to cook a kettle of Khichri for the Guru's family. The tradition of Mai Ji's selfless service is continued by Gurdwara Handi Sahib. Guru Gobind Singh created the Panj Pyare, five beloved administrators of the immortalizing nectar Amrit, and became the first to request initiation by them into the Khalsa nation of spiritual warriors. He made his spiritual consort, Mata Sahib Kaur, mother in name of Khalsa nation. Belief in the baptism ceremony of Amrit Sanchar, as established by Tenth Guru Gobind Singh, is essential to the definition of a Sikh. Guru Gobind Singh instructed initiates writing letters, or hukams, indicating his will that the Khalsa adhere to strict standards of living. The tenth guru outlined a "Rahit" or code of ethics for the Khalsa to live and die by. These edicts are the foundation on which the current code of conduct and conventions are based. The tenth guru also wrote hymns praising the virtues of Khalsa living which are included in a volume of his poetry called Dasam Granth. Guru Gobind Singh compiled the entire Sikhism scripture from memory and infused his light into the volume as his eternal successor Guru Granth Sahib. Guru Gobind Singh and his Khalsa warriors fought a series of battles between 1688 and 1707 against Mughal imperial forces advancing the Islamic policies of Emperor Aurangzeb. Though vastly outnumbered valorous Sikh men and women fearlessly served their Guru's cause with an undying devotion to their last breath. Tyranny and warfare exacted a tremendous and tragic toll personal on Tenth Guru Gobind Singh. His father Ninth Guru Teg Bahadur was absent his birth and away ministering to Sikhs during much of the boys' childhood. Guru Teg Bahadur was martyred by Islamic Mughal leaders when Guru Gobind Singh was merely nine years of age. All four of the tenth guru's sons and his mother Gujri were also martyred by the Mughals. A great many Sikhs also lost their lives at the hands of the Mughal empire. 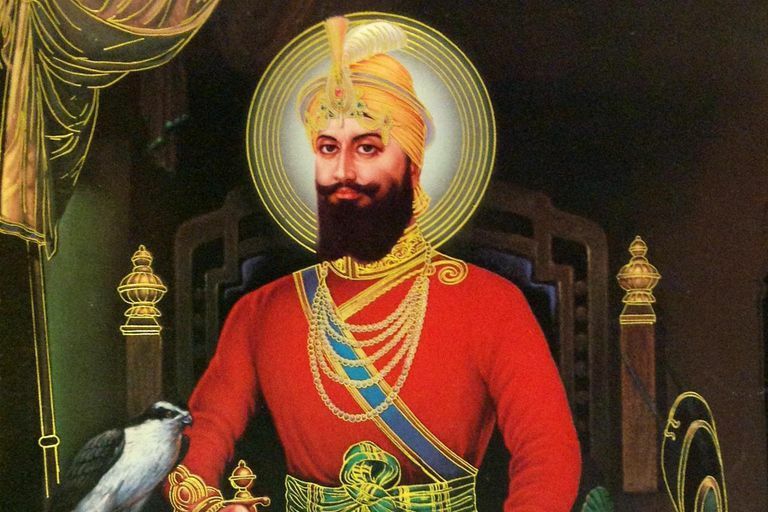 Guru Gobind Singh's legacy is an inspiration to all Sikhs. Author Jessi Kaur has fashioned tales and musical plays based on characters and incidents from the historic period of the tenth guru's exemplary life. Do You Know the 52 Hukams of Guru Gobind Singh?